What Did The Periodic Table Almost Look Like? The lanthanide /ˈlænθənaɪd/ or lanthanoid /ˈlænθənɔɪd/ series of chemical elements comprises the fifteen metallic chemical elementswith atomic numbers 57 through 71, from lanthanum through lutetium. These fifteen lanthanide elements, along with the chemically similar elements scandium and yttrium, are often collectively known as the rare earth elements. The informal chemical symbol Ln is used in general discussions of lanthanide chemistry to refer to any lanthanide. All but one of the lanthanides are f-block elements, corresponding to the filling of the 4f electron shell; lutetium, a d-block element, is also generally considered to be a lanthanide due to its chemical similarities with the other fourteen. All lanthanide elements form trivalent cations, Ln3+, whose chemistry is largely determined by the ionic radius, which decreases steadily from lanthanum to lutetium. They are termed as lanthanides because the lighter elements in the series are chemically similar to lanthanum. Strictly speaking, both lanthanum and lutetium have been labeled as group 3 elements, because they both have a single valence electron in the d shell. However, both elements are often included in any general discussion of the chemistry of the lanthanide elements. In presentations of the periodic table, the lanthanides and the actinides are customarily shown as two additional rows below the main body of the table, with placeholders or else a selected single element of each series (either lanthanum and actinium, or lutetium and lawrencium) shown in a single cell of the main table, between barium and hafnium, and radium and rutherfordium, respectively. This convention is entirely a matter of aesthetics and formatting practicality; a rarely used wide-formatted periodic table inserts the lanthanide and actinide series in their proper places, as parts of the table’s sixth and seventh rows (periods). Together with scandium and yttrium, the trivial name “rare earths” is sometimes used to describe all the lanthanides. This name arises from the minerals from which they were isolated, which were uncommon oxide-type minerals. However, the use of the name is deprecated by IUPAC, as the elements are neither rare in abundance nor “earths” (an obsolete term for water-insoluble strongly basic oxides of electropositive metals incapable of being smelted into metal using late 18th century technology). Cerium is the 26th most abundant element in the Earth’s crust, neodymium is more abundant than gold and even thulium (the least common naturally occurring lanthanide) is more abundant than iodine, which is itself common enough for biology to have evolved critical usages thereof. Despite their abundance, even the technical term “lanthanides” could be interpreted to reflect a sense of elusiveness on the part of these elements, as it comes from the Greek λανθανειν (lanthanein), “to lie hidden”. However, if not referring to their natural abundance, but rather to their property of “hiding” behind each other in minerals, this interpretation is in fact appropriate. The etymology of the term must be sought in the first discovery of lanthanum, at that time a so-called new rare earth element “lying hidden” in a cerium mineral, and it is an irony that lanthanum was later identified as the first in an entire series of chemically similar elements and could give name to the whole series. The term “lanthanide” was introduced by Victor Goldschmidt in 1925. Gschneider and Daane (1988) attribute the trend in melting point which increases across the series, (lanthanum (920 °C) – lutetium (1622 °C)) to the extent of hybridisation of the 6s, 5d and 4f orbitals. The hybridisation is believed to be at its greatest for cerium which has the lowest melting point of all, 795 °C. The lanthanide metals are soft, their hardness increases across the series. Europium stands out as it has the lowest density in the series at 5.24 g/cm3 and the largest metallic radius in the series at 208.4 pm. It can be compared to barium which has a metallic radius of 222 pm. It is believed that the metal contains the larger Eu2+ ion and that there are only two electrons in the conduction band. Ytterbium also has large metallic radius and a similar explanation is suggested. The resistivities of the lanthanide metals are relatively high, ranging from 29 to 134 μ Ohm·cm. These values can be compared to a good conductor such as aluminium which has a resistivity of 2.655 μ Ohm·cm. With the exceptions of La, Yb and Lu (which have no unpaired f electrons) the lanthanides are strongly paramagnetic and this is reflected in their magnetic susceptibilities. Gadolinium becomes ferromagnetic at below 16 °C (Curie point). The other heavier lanthanides, terbium, dysprosium, holmium, erbium, thulium and ytterbium become ferromagnetic at much lower temperatures. Going across the lanthanides, in the periodic table, the 4f orbitals are usually being filled. The effect of the 4f orbitals on the chemistry of the lanthanides is profound and is the factor that distinguishes them from the transition metals. There are seven 4f orbitals and there are two different ways in which they are depicted, firstly as a “cubic set” or as a general set. The cubic set is fz3, fxz2, fyz2, fxyz, fz(x2−y2), fx(x2−3y2) and fy(3x2−y2). The 4f orbitals penetrate the [Xe] core and are isolated and do not participate in bonding. This explains why crystal field effects are small and why they do not form π bonds. As there are seven 4f orbitals the number of unpaired electrons can be as high as 7 which gives rise to the large magnetic moments observed for lanthanide compounds. Measuring the magnetic moment can be used to investigate the 4f electron configuration and this is a useful tool in providing an insight into the chemical bonding. The lanthanide contraction, the reduction in size of the Ln3+ ion from La3+(103 pm)- Lu3+(86.1 pm) is often explained by the poor shielding of the 5s and 5p electrons by the 4f electrons. Lanthanide oxides: clockwise from top center: praseodymium, cerium, lanthanum, neodymium, samarium and gadolinium. The electronic structure of the lanthanide elements, with minor exceptions is [Xe]6s24fn. The chemistry of the lanthanides is dominated by the +3 oxidation state and in LnIII compounds the 6s electrons and (usually) one 4f electron are lost and the ions have the configuration [Xe]4fm. All the lanthanide elements exhibit the oxidation state +3. In addition Ce3+ can lose its single f electron to form Ce4+ with the stable electronic configuration of xenon. Also, Eu3+ can gain an electron to form Eu2+ with the f7 configuration which has the extra stability of a half-filled shell. Other than Ce(IV) and Eu(II), none of the lanthanides are stable in oxidation states other than +3 in aqueous solution.Promethium is effectively a man-made element as all its isotopes are radioactive with half-lives shorter than 20 years. In terms of reduction potentials, the Ln0/3+ couples are nearly the same for all lanthanides, ranging from −1.99 (for Eu) to −2.35 V (for Pr). Thus, these metals are highly reducing, with reducing power similar to alkaline earth metals such as Mg (−2.36 V). All of the lanthanide elements are commonly known to have the +3 oxidation state and it was thought that only samarium, europium, and ytterbium had the +2 oxidation readily accessible in solution. Now, it is known that all of the lanthanides can form +2 complexes in solution. The ionisation energies for the lanthanides can be compared with aluminium. In aluminium the sum of the first three ionisation energies is 5139 kJ·mol−1, whereas the lanthanides fall in the range 3455 – 4186 kJ·mol−1. This correlates with the highly reactive nature of the lanthanides. The sum of the first two ionisation energies for europium, 1632 kJ·mol−1 can be compared with that of barium 1468.1 kJ·mol−1 and europium’s third ionisation energy is the highest of the lanthanides. The sum of the first two ionisation energies for ytterbium are the second lowest in the series and its third ionisation energy is the second highest. The high third ionisation energy for Eu and Yb correlate with the half filling 4f7 and complete filling 4f14 of the 4f sub shell, and the stability afforded by such configurations due to exchange energy. Europium and ytterbium form salt like compounds with Eu2+ and Yb2+, for example the salt like dihydrides,. Both europium and ytterbium dissolve in liquid ammonia forming solutions of Ln2+(NH3)x again demonstrating their similarities to the alkaline earth metals. The relative ease with which the 4th electron can be removed in cerium and (to a lesser extent praseodymium) indicates why Ce(IV) and Pr(IV) compounds can be formed, for example CeO2 is formed rather than Ce2O3 when cerium reacts with oxygen. The similarity in ionic radius between adjacent lanthanide elements makes it difficult to separate them from each other in naturally occurring ores and other mixtures. Historically, the very laborious processes of cascading and fractional crystallization were used. Because the lanthanide ions have slightly different radii, the lattice energy of their salts and hydration energies of the ions will be slightly different, leading to a small difference in solubility. Salts of the formula Ln(NO3)3·2NH4NO3·4H2O can be used. Industrially, the elements are separated from each other by solvent extraction. Typically an aqueous solution of nitrates is extracted into kerosene containing tri-n-butylphosphate. The strength of the complexes formed increases as the ionic radius decreases, so solubility in the organic phase increases. Complete separation can be achieved continuously by use ofcountercurrent exchange methods. The elements can also be separated by ion-exchange chromatography, making use of the fact that the stability constant for formation ofEDTA complexes increases for log K ≈ 15.5 for [La(EDTA)]− to log K ≈ 19.8 for [Lu(EDTA)]−. When in the form of coordination complexes, lanthanides exist overwhelmingly in their +3 oxidation state, although particularly stable 4f configurations can also give +4 (Ce, Tb) or +2 (Eu, Yb) ions. All of these forms are strongly electropositive and thus lanthanide ions are hard Lewis acids. The oxidation states are also very stable and with the exception of SmI2 and cerium(IV) salts lanthanides are not used for redox chemistry. 4f electrons have a high probability of being found close to the nucleus and are thus strongly affected as the nuclear charge increases across the series; this results in a corresponding decrease in ionic radii referred to as the lanthanide contraction. The low probability of the 4f electrons existing at the outer region of the atom or ion permits little effective overlap between the orbitals of a lanthanide ion and any binding ligand. Thus lanthanide complexes typically have little or no covalent character and are not influenced by orbital geometries. The lack of orbital interaction also means that varying the metal typically has little effect on the complex (other than size), especially when compared to transition metals. Complexes are held together by weaker electrostatic forces which are omni-directional and thus the ligands alone dictate the symmetry and coordination of complexes. Steric factors therefore dominate, with coordinative saturation of the metal being balanced against inter-ligand repulsion. This results in a diverse range of coordination geometries, many of which are irregular, and also manifests itself in the highlyfluxional nature of the complexes. As there is no energetic reason to be locked into a single geometry rapid intramolecular and intermolecular ligand exchange will take place, which typically results in complexes which will rapidly fluctuate between all possible configurations. Many of these features make lanthanide complexes effective catalysts. Hard Lewis acids are able to polarise bonds upon coordination and thus alter the electrophilicity of compounds, with a classic example being the Luche reduction. The large size of the ions coupled with their labile ionic bonding allows even bulky coordinating species to bind and dissociate rapidly, resulting in very high turnover rates; thus excellent yields can often be achieved with loadings of only a few mol%. The lack of orbital interactions combined with the lanthanide contraction means that the lanthanides change in size across the series but that their chemistry remains much the same. This allows for easy tuning of the steric environments and examples exist where this has been used to improve the catalytic activity of the complex and change the nuclearity of metal clusters. Despite this, the use of lanthanide coordination complexes as homogeneous catalysts is largely restricted to the laboratory and there are currently few examples them being used on an industrial scale. It should be noted however, that lanthanides exist in many forms other that coordination complexes and many of these are industrially useful. In particular lanthanide metal oxides are used as heterogeneous catalysts in various industrial processes. The trivalent lanthanides mostly form ionic salts. The trivalent ions are hard acceptors and form more stable complexes with oxygen-donor ligands than with nitrogen-donor ligands. The larger ions are 9-coordinate in aqueous solution, [Ln(H2O)9]3+ but the smaller ions are 8-coordinate, [Ln(H2O)8]3+. There is some evidence that the later lanthanides have more water molecules in the second coordination sphere. Complexation with monodentate ligands is generally weak because it is difficult to displace water molecules from the first coordination sphere. Stronger complexes are formed with chelating ligands because of the chelate effect, such as the tetra-anion derived from 1,4,7,10-tetraazacyclododecane-1,4,7,10-tetraacetic acid (DOTA). The most common divalent derivatives of the lanthanides are for Eu(II), which achieves a favorable f7 configuration. Divalent halide derivatives are known for all of the lanthanides. They are either conventional salts or are Ln(III) “electride“-like salts. The simple salts include YbI2, EuI2, and SmI2. The electride-like salts, described as Ln3+, 2I−, e−, include LaI2, CeI2 and GdI2. Many of the iodides form soluble complexes with ethers, e.g. TmI2(dimethoxyethane)3. Samarium(II) iodide is a useful reducing agent. Ln(II) complexes can be synthesized by transmetalation reactions. Ce(IV) in ceric ammonium nitrate is a useful oxidizing agent. Otherwise tetravalent lanthanides are rare. The Ce(IV) is the exception owing to the tendency to form an unfilled f shell. Lanthanide metals react exothermically with hydrogen to form LnH2, dihydrides. With the exception of Eu and Yb which resemble the Ba and Ca hydrides (non conducting,transparent salt like compounds) they form black pyrophoric, conducting compounds where the metal sub-lattice is face centred cubic and the H atoms occupy tetrahedral sites. Further hydrogenation produces a trihydride which is non-stoichiometric, non-conducting, more salt like. The formation of trihydride is associated with and increase in 8-10% volume and this is linked to greater localisation of charge on the hydrogen atoms which become more anionic (H− hydride anion) in character. Some of the dihalides are conducting while the rest are insulators. The conducting forms can be considered as LnIII electride compounds where the electron is delocalised into a conduction band, Ln3+ (X−)2(e−). All of the diodides have relatively short metal-metal separations. The CuTi2 structure of the lanthanum, cerium and praseodymium diodides along with HP-NdI2 contain 44 nets of metal and iodine atoms with short metal-metal bonds (393-386 La-Pr). these compounds should be considered to be two-dimensional metals (two-dimensional in the same way that graphite is). The salt like dihalides include those of Eu Dy Tm and Yb. The formation of a relatively stable +2 oxidation state for Eu and Yb is usually explained by the stability (exchange energy) of half filled (f7) and fully filled f14. GdI2 possesses the layered MoS2 structure, is ferromagnetic and exhibits colossal magnetoresistance The sesquihalides Ln2X3 and the Ln7I12 compounds listed in the table contain metal clusters, discrete Ln6I12 clusters in Ln7I12 and condensed clusters forming chains in the sesquihalides. Scandium forms a similar cluster compound with chlorine, Sc7Cl12 Unlike many transition metal clusters these lanthanide clusters do not have strong metal-metal interactions and this is due to the low number of valence electrons involved, but instead are stabilised by the surrounding halogen atoms. LaI is the only known monohalide. Prepared from the reaction of LaI3 and La metal, it has a NiAs type structure and can be formulated La3+ (I−)(e−)2. All of the lanthanides form sesquioxides, Ln2O3. The lighter/larger lanthanides adopt a hexagonal 7-coordinate structure while the heavier/smaller ones adopt a cubic 6-coordinate “C-M2O3” structure. All of the sesquioxides are basic, and absorb water and carbon dioxide from air to form carbonates, hydroxides and hydroxycarbonates.They dissolve in acids to form salts. Cerium forms a stoichiometric dioxide, CeO2, where cerium has an oxidation state of +4. CeO2 is basic and dissolves with difficulty in acid to form Ce4+ solutions, from which CeIVsalts can be isolated, for example the hydrated nitrate Ce(NO3)4.5H2O. CeO2 is used as an oxidation catalyst in catalytic converters. Praseodymium and terbium form non-stoichiometric oxides containing LnIV, although more extreme reaction conditions can produce stoichiometric (or near stoichiometric) PrO2 and TbO2. Europium and ytterbium form salt-like monoxides, EuO and YbO, which have a rock salt structure. EuO is ferromagnetic at low temperatures, and is a semiconductor with possible applications in spintronics. A mixed EuII/EuIII oxide Eu3O4 can be produced by reducing Eu2O3 in a stream of hydrogen. Neodymium and samarium also form monoxides, but these are shiny conducting solids, although the existence of samarium monoxide is considered dubious. All of the lanthanides form hydroxides, Ln(OH)3. With the exception of lutetium hydroxide, which has a cubic structure, they have the hexagonal UCl3 structure. The hydroxides can be precipitated from solutions of LnIII. They can also be formed by the reaction of the sesquioxide, Ln2O3, with water, but although this reaction is thermodynamically favourable it is kinetically slow for the heavier members of the series. Fajan’s rules indicate that the smaller Ln3+ ions will be more polarizing and their salts correspondingly less ionic. The hydroxides of the heavier lanthanides become less basic, for example Yb(OH)3 and Lu(OH)3 are still basic hydroxides but will dissolve in hot concentratedNaOH. All of the lanthanides form Ln2Q3 (Q= S, Se, Te). The sesquisulfides can be produced by reaction of the elements or (with the exception of Eu2S3) sulfidizing the oxide (Ln2O3) with H2S. The sesquisulfides, Ln2S3 generally lose sulfur when heated and can form a range of compositions between Ln2S3 and Ln3S4. The sesquisulfides are insulators but some of the Ln3S4 are metallic conductors (e.g. Ce3S4) formulated (Ln3+)3 (S2−)4 (e−), while others (e.g. Eu3S4 and Sm3S4) are semiconductors. Structurally the sesquisulfides adopt structures that vary according the size of the Ln metal. The lighter and larger lanthanides favouring 7 coordinate metal atoms, the heaviest and smallest lanthanides (Yb and Lu) favouring 6 coordination and the rest structures with a mixture of 6 and 7 coordination. Polymorphism is common amongst the sesquisulfides. The colors of the sesquisulfides vary metal to metal and depend on the polymorphic form. The colors of the γ-sesquisulfides are La2S3, white/yellow; Ce2S3, dark red; Pr2S3, green; Nd2S3, light green; Gd2S3, sand; Tb2S3, light yellow and Dy2S3, orange. The shade of γ-Ce2S3 can be varied by doping with Na or Ca with hues ranging from dark red to yellow, and Ce2S3 based pigments are used commercially and are seen as low toxicity substitutes for cadmium based pigments. All of the lanthanides form monochalcogenides, LnQ, (Q= S, Se, Te). The majority of the monochalcogenides are conducting, indicating a formulation LnIIIQ2−(e-) where the electron is in conduction bands. The exceptions are SmQ, EuQ and YbQ which are semiconductors or insulators but exhibit a pressure induced transition to a conducting state.Compounds LnQ2 are known but these do not contain LnIV but are LnIII compounds containing polychalcogenide anions. Oxysulfides Ln2O2S are well known, they all have the same structure with 7 coordinate Ln atoms with 3 sulfur atoms and 4 oxygen as near neighbours. Doping these with other lanthanide elements produces phosphors. As an example, gadolinium oxysulfide, Gd2O2S doped with Tb3+ produces visible photons when irradiated with high energy X-rays and is used as a scintillator in flat panel detectors. When mischmetal, an alloy of lanthanide metals, is added to molten steel to remove oxygen and sulfur, stable oxysulfides are produced that form an immiscible solid. All of the lanthanides form a mononitride, LnN, with the rock salt structure. The mononitrides have attracted interest because of their unusual physical properties. SmN and EuN are reported as being “half metals“. NdN, GdN, TbN and DyN are ferromagnetic, SmN is antiferromagnetic. Applications in the field of spintronics are being investigated.CeN is unusual as it is a metallic conductor, contrasting with the other nitrides also with the other cerium pnictides. A simple description is Ce4+ N3− (e–) but the interatomic distances are a better match for the trivalent state rather than for the tetravalent state. A number of different explanations have been offered. The nitrides can be prepared by the reaction of lanthanum metals with nitrogen. Some nitride is produced along with the oxide, when lanthanum metals are ignited in air. Alternative methods of synthesis are a high temperature reaction of lanthanide metals with ammonia or the decomposition of lanthanide amides, Ln(NH2)3. Achieving pure stoichiometric compounds, and crystals with low defect density has proved difficult. 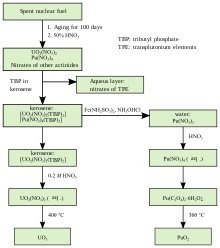 The lanthanide nitrides are sensitive to air and hydrolyse producing ammonia. The other pnictides phosphorus, arsenic, antimony and bismuth also react with the lanthanide metals to form monopnictides, LnQ. Additionally a range of other compounds can be produced with varying stoichiometries, such as LnP2, LnP5, LnP7 Ln3As, Ln5As3 and LnAs2. Carbides of varying stoichiometries are known for the lanthanides. Non-stoichiometry is common. All of the lanthanides form LnC2 and Ln2C3 which both contain C2 units. The dicarbides with exception of EuC2, are metallic conductors with the calcium carbide structure and can be formulated as Ln3+C22−(e–). The C-C bond length is longer than that inCaC2, which contains the C22− anion, indicating that the antibonding orbitals of the C22− anion are involved in the conduction band. These dicarbides hydrolyse to form hydrogen and a mixture of hydrocarbons. EuC2 and to a lesser extent YbC2 hydrolyse differently producing a higher percentage of acetylene (ethyne). The sesquicarbides, Ln2C3 can be formulated as Ln4(C2)3. These compounds adopt the Pu2C3 structure which has been described as having C22− anions in bisphenoid holes formed by eight near Ln neighbours. The lengthening of the C-C bond is less marked in the sesquicarbides than in the dicarbides, with the exception of Ce2C3. Other carbon rich stoichiometries are known for some lanthanides. Ln3C4 (Ho-Lu) containing C, C2 and C3 units; Ln4C7 (Ho- Lu) contain C atoms and C3 units and Ln4C5 (Gd-Ho) containing C and C2 units.Metal rich carbides contain interstitial C atoms and no C2 or C3 units. These are Ln4C3 (Tb and Lu); Ln2C (Dy, Ho, Tm) and Ln3C (Sm-Lu). All of the lanthanides form a number of borides. The “higher” borides (LnBx where x > 12) are insulators/semiconductors whereas the lower borides are typically conducting. The lower borides have stoichiometries of LnB2, LnB4, LnB6 and LnB12. Applications in the field of spintronics are being investigated. The range of borides formed by the lanthanides can be compared to those formed by the transition metals. The boron rich borides are typical of the lanthanides (and groups 1-3) whereas for the transition metals tend to form metal rich, “lower” borides. The lanthanide borides are typically grouped together with the group 3 metals with which they share many similarities of reactivity, stoichiometry and structure. Collectively these are then termed the rare earth borides. Many methods of producing lanthanide borides have been used, amongst them are direct reaction of the elements; the reduction of Ln2O3 with boron; reduction of boron oxide, B2O3, and Ln2O3 together with carbon; reduction of metal oxide with boron carbide, B4C. Producing high purity samples has proved to be difficult. Single crystals of the higher borides have been grown in a low melting metal (e.g. Sn, Cu, Al). Diborides, LnB2, have been reported for Sm, Gd, Tb, Dy, Ho, Er, Tm, Yb and Lu. All have the same, AlB2, structure containing a graphitic layer of boron atoms. Low temperature ferromagnetic transitions for Tb, Dy, Ho and Er. TmB2 is ferromagnetic at 7.2 K.
Tetraborides, LnB4 have been reported for all of the lanthanides except EuB4, all have the same UB4 structure. The structure has a boron sub-lattice consists of chains of octahedral B6 clusters linked by boron atoms. The unit cell decreases in size successively from LaB4 to LuB4. The tetraborides of the lighter lanthanides melt with decomposition to LnB6. Attempts to make EuB4 have failed. The LnB4 are good conductors and typically antiferromagnetic. Hexaborides, LnB6 have been reported for all of the lanthanides. They all have the CaB6 structure, containing B6 clusters. They are non-stoichiometric due to cation defects. The hexaborides of the lighter lanthanides (La – Sm) melt without decomposition, EuB6 decomposes to boron and metal and the heavier lanthanides decompose to LnB4 with exception of YbB6 which decomposes forming YbB12. The stability has in part been correlated to differences in volatility between the lanthanide metals. In EuB6 and YbB6 the metals have an oxidation state of +2 whereas in the rest of the lanthanide hexaborides it is +3. This rationalises the differences in conductivity, the extra electrons in the LnIIIhexaborides entering conduction bands. EuB6 is a semiconductor and the rest are good conductors. LaB6 and CeB6 are thermionic emitters, used, for example, in scanning electron microscopes. Dodecaborides, LnB12, are formed by the heavier smaller lanthanides, but not by the lighter larger metals, La – Eu. With the exception YbB12 (where Yb takes an intermediate valence and is a Kondo insulator), the dodecaborides are all metallic compounds. They all have the UB12 structure containing a 3 dimensional framework of cubooctahedral B12clusters. The higher boride LnB66 is known for all lanthanide metals. The composition is approximate as the compounds are non-stoichiometric. They all have similar complex structurewith over 1600 atoms in the unit cell. The boron cubic sub lattice contains super icosahedra made up of a central B12 icosahedra surrounded by 12 others, B12(B12)12. Other complex higher borides LnB50 (Tb, Dy, Ho Er Tm Lu) and LnB25 are known (Gd, Tb, Dy, Ho, Er) and these contain boron icosahedra in the boron framework. Lanthanide-carbon σ bonds are well known; however as the 4f electrons have a low probability of existing at the outer region of the atom there is little effective orbital overlap, resulting in bonds with significant ionic character. As such organo-lanthanide compounds exhibit carbanion-like behaviour, unlike in transition metal organometallic compounds. Because of their large size, lanthanides tend to form more stable organometallic derivatives with bulky ligands to give compounds such as Ln[CH(SiMe3)3]. Similarly complexes of cyclopentadienyl anion (Cp−), e.g. [Ln(C5H5)3], are far less common than the corresponding pentamethylcyclopentadienyl, e.g. [Ln(C5Me5)3Cl]. Analogues of uranocene are derived from dilithiocyclooctatetraene, Li2C8H8. Organic lanthanide(II) compounds are also known, such as Cp*2Eu. All the trivalent lanthanide ions, except lanthanum and lutetium, have unpaired f electrons. However, the magnetic moments deviate considerably from the spin-only valuesbecause of strong spin-orbit coupling. The maximum number of unpaired electrons is 7, in Gd3+, with a magnetic moment of 7.94 B.M., but the largest magnetic moments, at 10.4–10.7 B.M., are exhibited by Dy3+ and Ho3+. However, in Gd3+ all the electrons have parallel spin and this property is important for the use of gadolinium complexes ascontrast reagent in MRI scans. Crystal field splitting is rather small for the lanthanide ions and is less important than spin-orbit coupling in regard to energy levels.Transitions of electrons between f orbitals are forbidden by the Laporte rule. Furthermore, because of the “buried” nature of the f orbitals, coupling with molecular vibrations is weak. Consequently, the spectra of lanthanide ions are rather weak and the absorption bands are similarly narrow. Glass containing holmium oxide and holmium oxide solutions (usually in perchloric acid) have sharp optical absorption peaks in the spectral range 200–900 nm and can be used as a wavelength calibration standard for optical spectrophotometers, and are available commercially. As f-f transitions are Laporte-forbidden, once an electron has been excited, decay to the ground state will be slow. This makes them suitable for use in lasers as it makes the population inversion easy to achieve. The Nd:YAG laser is one that is widely used. Europium-doped yttrium vanadate was the first red phosphor to enable the development of color television screens. Lanthanide ions have notable luminescent properties due to their unique 4f orbitals. Laporte forbidden f-f transitions can be activated by excitation of a bound “antenna” ligand. This leads to sharp emission bands throughout the visible, NIR, and IR and relatively long luminescence lifetimes. The lanthanide contraction is responsible for the great geochemical divide that splits the lanthanides into light and heavy-lanthanide enriched minerals, the latter being almost inevitably associated with and dominated by yttrium. This divide is reflected in the first two “rare earths” that were discovered: yttria (1794) and ceria (1803). The geochemical divide has put more of the light lanthanides in the Earth’s crust, but more of the heavy members in the Earth’s mantle. The result is that although large rich ore-bodies are found that are enriched in the light lanthanides, correspondingly large ore-bodies for the heavy members are few. The principal ores are monazite and bastnäsite. Monazite sands usually contain all the lanthanide elements, but the heavier elements are lacking in bastnäsite. The lanthanides obey the Oddo-Harkins rule – odd-numbered elements are less abundant than their even-numbered neighbors. Three of the lanthanide elements have radioactive isotopes with long half-lives (138La, 147Sm and 176Lu) that can be used to date minerals and rocks from Earth, the Moon and meteorites. Lanthanide elements and their compounds have many uses but the quantities consumed are relatively small in comparison to other elements. About 15000 ton/year of the lanthanides are consumed as catalysts and in the production of glasses. This 15000 tons corresponds to about 85% of the lanthanide production. From the perspective of value, however, applications in phosphors and magnets are more important. The devices lanthanide elements are used in include superconductors, samarium-cobalt and neodymium-iron-boron high-flux rare-earth magnets, magnesium alloys, electronic polishers, refining catalysts and hybrid car components (primarily batteries and magnets). Lanthanide ions are used as the active ions in luminescent materials used inoptoelectronics applications, most notably the Nd:YAG laser. Erbium-doped fiber amplifiers are significant devices in optical-fiber communication systems. Phosphors with lanthanide dopants are also widely used in cathode ray tube technology such as television sets. The earliest color television CRTs had a poor-quality red; europium as a phosphor dopant made good red phosphors possible. Yttrium iron garnet (YIG) spheres can act as tunable microwave resonators. Lanthanide oxides are mixed with tungsten to improve their high temperature properties for welding, replacing thorium, which was mildly hazardous to work with. Many defense-related products also use lanthanide elements such as night vision goggles and rangefinders. The SPY-1 radar used in some Aegis equipped warships, and the hybrid propulsion system of Arleigh Burke-class destroyers all use rare earth magnets in critical capacities. The price for lanthanum oxide used in fluid catalytic cracking has risen from $5 per kilogram in early 2010 to $140 per kilogram in June 2011. The complex Gd(DOTA) is used in magnetic resonance imaging. As mentioned in the industrial applications section above, lanthanide metals are particularly useful in technologies that take advantage of their reactivity to specific wavelengths of light. Certain life science applications take advantage of the unique fluorescence properties of lanthanide ion complexes (Ln(III) chelates or cryptates). These are well-suited for this application due to their large Stokes shifts and extremely long emission lifetimes (from microseconds to milliseconds) compared to more traditional fluorophores (e.g.,fluorescein, allophycocyanin, phycoerythrin, and rhodamine). The biological fluids or serum commonly used in these research applications contain many compounds and proteins which are naturally fluorescent. Therefore, the use of conventional, steady-state fluorescence measurement presents serious limitations in assay sensitivity. Long-lived fluorophores, such as lanthanides, combined with time-resolved detection (a delay between excitation and emission detection) minimizes prompt fluorescence interference. Time-resolved fluorometry (TRF) combined with fluorescence resonance energy transfer (FRET) offers a powerful tool for drug discovery researchers: Time-Resolved Fluorescence Resonance Energy Transfer or TR-FRET. TR-FRET combines the low background aspect of TRF with the homogeneous assay format of FRET. The resulting assay provides an increase in flexibility, reliability and sensitivity in addition to higher throughput and fewer false positive/false negative results. This method involves two fluorophores: a donor and an acceptor. Excitation of the donor fluorophore (in this case, the lanthanide ion complex) by an energy source (e.g. flash lamp or laser) produces an energy transfer to the acceptor fluorophore if they are within a given proximity to each other (known as the Förster’s radius). The acceptor fluorophore in turn emits light at its characteristic wavelength. The two most commonly used lanthanides in life science assays are shown below along with their corresponding acceptor dye as well as their excitation and emission wavelengths and resultant Stokes shift (separation of excitation and emission wavelengths). Due to their sparse distribution in the earth’s crust and low aqueous solubility, the lanthanides have a low availability in the biosphere, and are not known to naturally form part of any biological molecules. Compared to most other nondietary elements, non-radioactive lanthanides are classified as having low toxicity. 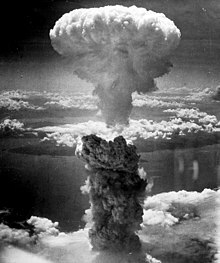 The atomic bomb dropped on Nagasaki had a plutonium charge. The actinide /ˈæktɨnaɪd/ or actinoid /ˈæktɨnɔɪd/ (IUPAC nomenclature) series encompasses the 15 metallic chemical elements with atomic numbers from 89 to 103, actinium through lawrencium. The actinide series derives its name from the first element in the series, actinium. The informal chemical symbol An is used in general discussions of actinide chemistry to refer to any actinide. All but one of the actinides are f-block elements, corresponding to the filling of the 5f electron shell; lawrencium, a d-block element, is also generally considered an actinide. In comparison with the lanthanides, also mostlyf-block elements, the actinides show much more variable valence. They all have very large atomic and ionic radii and exhibit an unusually large range of physical properties. While actinium and the late actinides (from americium onwards) behave similarly to the lanthanides, the elements thorium through neptunium are much more similar to transition metals in their chemistry. Of the actinides, primordial thorium and uranium occur naturally in substantial quantities and small amounts of persisting natural plutoniumhave also been identified. The radioactive decay of uranium produces transient amounts of actinium and protactinium, and atoms ofneptunium and plutonium are occasionally produced from transmutation reactions in uranium ores. The other actinides are purelysynthetic elements. Nuclear weapons tests have released at least six actinides heavier than plutonium into the environment; analysis of debris from a 1952 hydrogen bomb explosion showed the presence of americium, curium, berkelium, californium, einsteinium andfermium. All actinides are radioactive and release energy upon radioactive decay; naturally occurring uranium and thorium, and synthetically produced plutonium are the most abundant actinides on Earth. These are used in nuclear reactors and nuclear weapons. Uranium and thorium also have diverse current or historical uses, and americium is used in the ionization chambers of most modern smoke detectors. In presentations of the periodic table, the lanthanides and the actinides are customarily shown as two additional rows below the main body of the table, with placeholders or else a selected single element of each series (either lanthanum or lutetium, and either actinium orlawrencium, respectively) shown in a single cell of the main table, between barium and hafnium, and radium and rutherfordium, respectively. This convention is entirely a matter of aesthetics and formatting practicality; a rarely used wide-formatted periodic table inserts the lanthanide and actinide series in their proper places, as parts of the table’s sixth and seventh rows (periods). Like the lanthanides, the actinides form a family of elements with similar properties. Within the actinides, there are two overlapping groups: transuranium elements, which follow uranium in the periodic table—andtransplutonium elements, which follow plutonium. Compared to the lanthanides, which (except for promethium) are found in nature in appreciable quantities, most actinides are rare. The most abundant, or easy to synthesize actinides are uranium and thorium, followed by plutonium, americium, actinium, protactinium and neptunium. The existence of transuranium elements was suggested by Enrico Fermi based on his experiments in 1934. However, even though four actinides were known by that time, it was not yet understood that they formed a family similar to lanthanides. The prevailing view that dominated early research into transuranics was that they were regular elements in the 7th period, with thorium, protactinium and uranium corresponding to 6th-period hafnium, tantalum and tungsten, respectively. Synthesis of transuranics gradually undermined this point of view. By 1944 an observation that curium failed to exhibit oxidation states above 4 (whereas its supposed 6th period homolog, platinum, can reach oxidation state of 6) prompted Glenn Seaborg to formulate a so-called “actinide hypothesis”. Studies of known actinides and discoveries of further transuranic elements provided more data in support of this point of view, but the phrase “actinide hypothesis” (the implication being that “hypothesis” is something that has not been decisively proven) remained in active use by scientists through the late 1950s. At present, there are two major methods of producing isotopes of transplutonium elements: irradiation of the lighter elements with either neutrons or accelerated charged particles. The first method is most important for applications, as only neutron irradiation using nuclear reactors allows the production of sizeable amounts of synthetic actinides; however, it is limited to relatively light elements. The advantage of the second method is that elements heavier than plutonium, as well as neutron-deficient isotopes, can be obtained, which are not formed during neutron irradiation. In 1962–1966, there were attempts in the United States to produce transplutonium isotopes using a series of six underground nuclear explosions. Small samples of rock were extracted from the blast area immediately after the test to study the explosion products, but no isotopes with mass number greater than 257 could be detected, despite predictions that such isotopes would have relatively long half-lives of α-decay. This inobservation was attributed to spontaneous fission owing to the large speed of the products and to other decay channels, such as neutron emission and nuclear fission. Enrico Fermi suggested the existence of transuranium elements in 1934. Uranium and thorium were the first actinides discovered. Uranium was identified in 1789 by the German chemist Martin Heinrich Klaprothin pitchblende ore. He named it after the planet Uranus, which had been discovered only eight years earlier. Klaproth was able to precipitate a yellow compound (likely sodium diuranate) by dissolving pitchblende in nitric acid and neutralizing the solution with sodium hydroxide. He then reduced the obtained yellow powder with charcoal, and extracted a black substance that he mistook for metal. Only 60 years later, the French scientist Eugène-Melchior Péligot identified it with uranium oxide. He also isolated the first sample of uranium metal by heating uranium tetrachloride with potassium. The atomic mass of uranium was then calculated as 120, but Dmitri Mendeleevin 1872 corrected it to 240 using his periodicity laws. This value was confirmed experimentally in 1882 by K. Zimmerman. Thorium oxide was discovered by Friedrich Wöhler in the mineral, which was found in Norway (1827). Jöns Jacob Berzeliuscharacterized this material in more detail by in 1828. By reduction of thorium tetrachloride with potassium, he isolated the metal and named it thorium after the Norse god of thunder and lightning Thor. The same isolation method was later used by Péligot for uranium. Actinium was discovered in 1899 by André-Louis Debierne, an assistant of Marie Curie, in the pitchblende waste left after removal of radium and polonium. He described the substance (in 1899) as similar to titanium and (in 1900) as similar to thorium. The discovery of actinium by Debierne was however questioned in 1971 and 2000, arguing that Debierne’s publications in 1904 contradicted his earlier work of 1899–1900. The name actinium comes from the Greek aktis, aktinos (ακτίς, ακτίνος), meaning beam or ray. This metal was discovered not by its own radiation but by the radiation of the daughter products. Owing to the close similarity of actinium and lanthanum and low abundance, pure actinium could only be produced in 1950. The term actinide was probably introduced by Victor Goldschmidt in 1937. Protactinium was possibly isolated in 1900 by William Crookes. It was first identified in 1913, when Kasimir Fajans and Oswald Helmuth Göhring encountered the short-lived isotope 234mPa (half-life 1.17 minutes) during their studies of the 238U decay. They named the new element brevium (from Latin brevis meaning brief); the name was changed to protoactinium (from Greek πρῶτος + ἀκτίς meaning “first beam element”) in 1918 when two groups of scientists, led by the Austrian Lise Meitner and Otto Hahn of Germany and Frederick Soddy and John Cranston of Great Britain, independently discovered 231Pa. The name was shortened to protactinium in 1949. This element was little characterized until 1960, when A. G. Maddock and his co-workers in the U.K. produced 130 grams of protactinium from 60 tonnes of waste left after extraction of uranium from its ore.
Neptunium (named for the planet Neptune, the next planet out from Uranus, after which uranium was named) was discovered by Edwin McMillan and Philip H. Abelson in 1940 inBerkeley, California. They produced the 239Np isotope (half-life = 2.4 days) by bombarding uranium with slow neutrons. It was the first transuranium element produced synthetically. 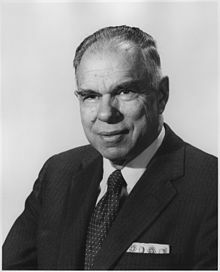 Glenn T. Seaborg and his group at the University of California at Berkeleysynthesized Pu, Am, Cm, Bk, Cf, Es, Fm, Md, No and element 106, which was later named seaborgium in his honor while he was still living. They also synthesized more than 100 atomic actinide isotopes. 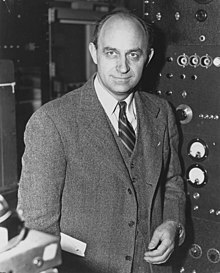 In this way, Enrico Fermi with collaborators, using the first nuclear reactor Chicago Pile-1, obtained significant amounts of plutonium-239, which were then used in nuclear weapons. The americium-241 and curium-242 isotopes also were produced by irradiating plutonium in a nuclear reactor. The latter element was named after Marie Curie and her husband Pierre who are noted for discovering radium and for their work in radioactivity. Bombarding curium-242 with α-particles resulted in an isotope of californium 245Cf (1950), and a similar procedure yielded in 1949berkelium-243 from americium-241. The new elements were named after Berkeley, California, by analogy with its lanthanidehomologue terbium, which was named after the village of Ytterby in Sweden. In 1945, B. B. Cunningham obtained the first bulk chemical compound of a transplutonium element, namely americium hydroxide. Over the next three to four years, milligram quantities of americium and microgram amounts of curium were accumulated that allowed production of isotopes of berkelium (Thomson, 1949) and californium (Thomson, 1950). Sizeable amounts of these elements were produced only in 1958 (Burris B. Cunningham and Stanley G. Thomson),and the first californium compound (0.3 µg of CfOCl) was obtained only in 1960 by B. B. Cunningham and J. C. Wallmann. Einsteinium and fermium were identified in 1952–1953 in the fallout from the “Ivy Mike” nuclear test (1 November 1952), the first successful test of a hydrogen bomb. Instantaneous exposure of uranium-238 to a large neutron flux resulting from the explosion produced heavy isotopes of uranium, including uranium-253 and uranium-255, and their β-decay yielded einsteinium-253 and fermium-255. The discovery of the new elements and the new data on neutron capture were initially kept secret on the orders of the U.S. military until 1955 due to Cold War tensions. Nevertheless, the Berkeley team were able to prepare einsteinium and fermium by civilian means, through the neutron bombardment of plutonium-239, and published this work in 1954 with the disclaimer that it was not the first studies that had been carried out on the elements. The “Ivy Mike” studies were declassified and published in 1955. The first significant (submicrograms) amounts of einsteinium were produced in 1961 by Cunningham and colleagues, but this has not been done for fermium yet. The first isotope of mendelevium, 256Md (half-life 87 min), was synthesized by Albert Ghiorso, Glenn T. Seaborg, Gregory R. Choppin, Bernard G. Harvey and Stanley G. Thompson when they bombarded an 253Es target with alpha particles in the 60-inch cyclotron of Berkeley Radiation Laboratory; this was the first isotope of any element to be synthesized one atom at a time. There were several attempts to obtain isotopes of nobelium by Swedish (1957) and American (1958) groups, but the first reliable result was the synthesis of 256No by the Russian group (Georgy Flyorov et al.) in 1965, as acknowledged by the IUPAC in 1992. In their experiments, Flyorov et al. bombarded uranium-238 with neon-22. In 1961, Ghiorso et al. obtained the first isotope of lawrencium by irradiating californium (mostly californium-252) with boron-10 and boron-11 ions. The mass number of this isotope was not clearly established (possibly 258 or 259) at the time. In 1965, 256Lr was synthesized by Flyorov et al. from 243Am and 18O. Thus IUPAC recognized the nuclear physics teams at Dubna and Berkeley as the co-discoverers of lawrencium. Actinides have 89 to 103 protons and usually have 117 to 159 neutrons. Thirty-one isotopes of actinium and eight excited isomeric states of some of its nuclides were identified by 2010. Three isotopes, 225Ac,227Ac and 228Ac, were found in nature and the others were produced in the laboratory; only the three natural isotopes are used in applications. Actinium-225 is a member of radioactive neptunium series; it was first discovered in 1947 as a fission product of uranium-233, it is an α-emitter with a half-life of 10 days. Actinium-225 is less available than actinium-228, but is more promising in radiotracer applications. Actinium-227 (half-life 21.77 years) occurs in all uranium ores, but in small quantities. One gram of uranium (in radioactive equilibrium) contains only 2×10−10 gram of 227Ac. Actinium-228 is a member of radioactive thorium series formed by the decay of228Ra; it is a β− emitter with a half-life of 6.15 hours. In one tonne of thorium there is 5×10−8 gram of 228Ac. It was discovered by Otto Hahn in 1906. Twenty nine isotopes of protactinium are known with mass numbers 212–240 as well as three excited isomeric states. Only 231Pa and234Pa have been found in nature. All the isotopes have short lifetime, except for protactinium-231 (half-life 32,760 years). The most important isotopes are 231Pa and 233Pa, which is an intermediate product in obtaining uranium-233 and is the most affordable among artificial isotopes of protactinium. 233Pa has convenient half-life and energy of γ-radiation, and thus was used in most studies of protactinium chemistry. Protactinium-233 is a β-emitter with a half-life of 26.97 days. Uranium has the highest number (25) of both natural and synthetic isotopes. They have mass numbers of 217–242, and three of them,234U, 235U and 238U, are present in appreciable quantities in nature. Among others, the most important is 233U, which is a final product of transformations of 232Th irradiated by slow neutrons. 233U has a very higher fission efficiency by low-energy (thermal) neutrons, compared e.g. with 235U. Most uranium chemistry studies were carried out on uranium-238 owing to its long half-life of 4.4×109 years. There are 19 isotopes of neptunium with mass numbers from 225 to 244; they are all highly radioactive. The most popular among scientists are long-lived 237Np (t1/2 = 2.20×106 years) and short-lived 239Np, 238Np (t1/2 ~ 2 days). Sixteen isotopes of americium are known with mass numbers from 232 to 248. The most important are 241Am and 243Am, which are alpha-emitters and also emit soft, but intense γ-rays; both of them can be obtained in an isotopically pure form. Chemical properties of americium were first studied with 241Am, but later shifted to 243Am, which is almost 20 times less radioactive. The disadvantage of 243Am is production of the short-lived daughter isotope 239Np, which has to be considered in the data analysis. Among 19 isotopes of curium, the most accessible are 242Cm and 244Cm; they are α-emitters, but with much shorter lifetime than the americium isotopes. These isotopes emit almost no γ-radiation, but undergo spontaneous fission with the associated emission of neutrons. More long-lived isotopes of curium (245–248Cm, all α-emitters) are formed as a mixture during neutron irradiation of plutonium or americium. Upon short irradiation, this mixture is dominated by curium-246, and then curium-248 begins to accumulate. Both of these isotopes, especially 248Cm, have a longer half-life (3.48×105 years) and are much more convenient for carrying out chemical research than 242Cm and 244Cm, but they also have a rather high rate of spontaneous fission. 247Cm has the longest lifetime among isotopes of curium (1.56×107 years), but is not formed in large quantities because of the strong fission induced by thermal neutrons. Fourteen isotopes of berkelium were identified with mass numbers 238–252. Only 249Bk is available in large quantities; it has a relatively short half-life of 330 days and emits mostly soft β-particles, which are inconvenient for detection. Its alpha radiation is rather weak (1.45×10−3% with respect to β-radiation), but is sometimes used to detect this isotope. 247Bk is an alpha-emitter with a long half-life of 1,380 years, but it is hard to obtain in appreciable quantities; it is not formed upon neutron irradiation of plutonium because of the β-stability of isotopes of curium isotopes with mass number below 248. Isotopes of californium with mass numbers 237–256 are formed in nuclear reactors; californium-253 is a β-emitter and the rest are α-emitters. The isotopes with even mass numbers (250Cf, 252Cf and 254Cf) have a high rate of spontaneous fission, especially 254Cf of which 99.7% decays by spontaneous fission. Californium-249 has a relatively long half-life (352 years), weak spontaneous fission and strong γ-emission that facilitates its identification. 249Cf is not formed in large quantities in a nuclear reactor because of the slow β-decay of the parent isotope 249Bk and a large cross section of interaction with neutrons, but it can be accumulated in the isotopically pure form as the β-decay product of (pre-selected) 249Bk. Californium produced by reactor-irradiation of plutonium mostly consists of 250Cf and 252Cf, the latter being predominant for large neutron fluences, and its study is hindered by the strong neutron radiation. Among the 16 known isotopes of einsteinium with mass numbers from 241 to 257 the most affordable is 253Es. It is an α-emitter with a half-life of 20.47 days, a relatively weak γ-emission and small spontaneous fission rate as compared with the isotopes of californium. 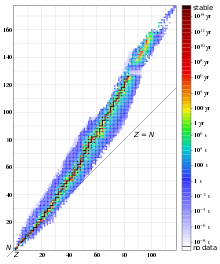 Prolonged neutron irradiation also produces a long-lived isotope 254Es (t1/2 = 275.5 days). Nineteen isotopes of fermium are known with mass numbers of 242–260. 254Fm, 255Fm and256Fm are α-emitters with a short half-life (hours), which can be isolated in significant amounts.257Fm (t1/2 = 100 days) can accumulate upon prolonged and strong irradiation. All these isotopes are characterized by high rates of spontaneous fission. Among the 15 known isotopes of mendelevium (mass numbers from 245 to 260), the most studied is 256Md, which mainly decays through the electron capture (α-radiation is ≈10%) with the half-life of 77 minutes. Another alpha emitter, 258Md, has a half-life of 53 days. Both these isotopes are produced from rare einsteinium (253Es and 255Es respectively), that therefore limits their availability. Long-lived isotopes of nobelium and isotopes of lawrencium (and of heavier elements) have relatively short half-lives. For nobelium 11 isotopes are known with mass numbers 250–260 and 262. The chemical properties of nobelium and lawrencium were studied with 255No (t1/2 = 3 min) and 256Lr (t1/2 = 35 s). The longest-lived nobelium isotope 259No has a half-life of 1.5 hours. 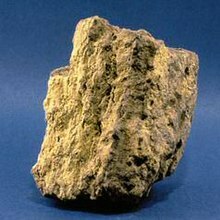 Thorium and uranium are the most abundant actinides in nature with the respective mass concentrations of 1.6×10−3% and 4×10−4%.Uranium mostly occurs in the Earth’s crust as a mixture of its oxides in the minerals uraninite, which is also called pitchblende because of its black color. There are several dozens of other uranium minerals such as carnotite (KUO2VO4·3H2O) and autunite(Ca(UO2)2(PO4)2·nH2O). The isotopic composition of natural uranium is 238U (relative abundance 99.2742%), 235U (0.7204%) and 234U(0.0054%); of these 238U has the largest half-life of 4.51×109 years. The worldwide production of uranium in 2009 amounted to 50,572 tonnes, of which 27.3% was mined in Kazakhstan. Other important uranium mining countries are Canada (20.1%), Australia (15.7%), Namibia (9.1%), Russia (7.0%), and Niger (6.4%). The most abundant thorium minerals are thorianite(ThO2), thorite (ThSiO4) and monazite, ((Th,Ca,Ce)PO4). Most thorium minerals contain uranium and vice versa; and they all have significant fraction of lanthanides. Rich deposits of thorium minerals are located in the United States (440,000 tonnes), Australia and India (~300,000 tonnes each) and Canada (~100,000 tonnes). The abundance of actinium in the Earth’s crust is only about 5×10−15%. Actinium is mostly present in uranium-containing, but also in other minerals, though in much smaller quantities. The content of actinium in most natural objects corresponds to the isotopic equilibrium of parent isotope 235U, and it is not affected by the weak Ac migration. Protactinium is more abundant (10−12%) in the Earth’s crust than actinium. It was discovered in the uranium ore in 1913 by Fajans and Göhring. As actinium, the distribution of protactinium follows that of 235U. The half-life of the longest-lived isotope of neptunium, 237Np, is negligible compared to the age of the Earth. Thus neptunium is present in nature in negligible amounts produced as intermediate decay products of other isotopes. Traces of plutonium in uranium minerals were first found in 1942, and the more systematic results on 239Pu are summarized in the table (no other plutonium isotopes could be detected in those samples). The upper limit of abundance of the longest-living isotope of plutonium, 244Pu, is 3×10−20%. Plutonium could not be detected in samples of lunar soil. Owing to its scarcity in nature, most plutonium is produced synthetically. Among the actinides, thorium and uranium are the easiest to isolate. Thorium is extracted mostly from monazite: thorium diphosphate (Th(PO4)2) is reacted with nitric acid, and the produced thorium nitrate treated with tributyl phosphate. Rare-earth impurities are separated by increasing the pH in sulfate solution. Sometimes thorium is extracted by electrolysis of a fluoride in a mixture of sodium and potassium chloride at 700–800 °C in a graphitecrucible. Highly pure thorium can be extracted from its iodide with the crystal bar process. Uranium is extracted from its ores in various ways. In one method, the ore is burned and then reacted with nitric acid to convert uranium into a dissolved state. Treating the solution with a solution of tributyl phosphate (TBP) in kerosene transforms uranium into an organic form UO2(NO3)2(TBP)2. The insoluble impurities are filtered and the uranium is extracted by reaction with hydroxides as (NH4)2U2O7 or with hydrogen peroxide as UO4·2H2O. This equation suggests that the best solvent for the uranium carbonate processing is a mixture of carbonate with bicarbonate. At high pH, this results in precipitation of diuranate, which is treated with hydrogen in the presence of nickel yielding an insoluble uranium tetracarbonate. To extract plutonium, neutron-irradiated uranium is dissolved in nitric acid, and a reducing agent (FeSO4, or H2O2) is added to the resulting solution. This addition changes the oxidation state of plutonium from +6 to +4, while uranium remains in the form of uranyl nitrate (UO2(NO3)2). The solution is treated with a reducing agent and neutralized withammonium carbonate to pH = 8 that results in precipitation of Pu4+ compounds. 2 are first extracted with tributyl phosphate, then reacted with hydrazine washing out the recovered plutonium. The major difficulty in separation of actinium is the similarity of its properties with those of lanthanum. Thus actinium is either synthesized in nuclear reactions from isotopes of radium or separated using ion-exchange procedures. Actinides have similar properties to lanthanides. The 6d and 7s electronic shells are filled in actinium and thorium, and the 5f shell is being filled with further increase in atomic number; the 4f shell is filled in the lanthanides. The first experimental evidence for the filling of the 5f shell in actinides was obtained by McMillan and Abelson in 1940. As in lanthanides (see lanthanide contraction), the ionic radius of actinides monotonically decreases with atomic number (see also Aufbau principle). A pellet of 238PuO2 to be used in aradioisotope thermoelectric generatorfor either the Cassini or Galileomission. The pellet produces 62 watts of heat and glows because of the heat generated by the radioactive decay (primarily α). Photo is taken after insulating the pellet under a graphiteblanket for minutes and removing the blanket. Actinides are typical metals. All of them are soft and have a silvery color (but tarnish in air), relatively high density and plasticity. Some of them can be cut with a knife. Their electrical resistivity varies between 15 and 150 µOhm·cm. The hardness of thorium is similar to that of soft steel, so heated pure thorium can be rolled in sheets and pulled into wire. Thorium is nearly half as dense as uranium and plutonium, but is harder than either of them. All actinides are radioactive, paramagnetic, and, with the exception of actinium, have several crystalline phases: plutonium has seven, and uranium, neptunium and californium three. Crystal structures of protactinium, uranium, neptunium and plutonium do not have clear analogs among the lanthanides and are more similar to those of the 3d–transition metals. All actinides are pyrophoric, especially when finely divided, that is, they spontaneously ignite upon reaction with air. The melting point of actinides does not have a clear dependence on the number of f-electrons. The unusually low melting point of neptunium and plutonium (~640 °C) is explained by hybridization of 5f and 6d orbitals and the formation of directional bonds in these metals. Like the lanthanides, all actinides are highly reactive with halogens and chalcogens; however, the actinides react more easily. Actinides, especially those with a small number of 5f-electrons, are prone to hybridization. This is explained by the similarity of the electron energies at the 5f, 7s and 6d shells. Most actinides exhibit a larger variety of valence states, and the most stable are +6 for uranium, +5 for protactinium and neptunium, +4 for thorium and plutonium and +3 for actinium and other actinides. Chemically, actinium is similar to lanthanum, which is explained by their similar ionic radii and electronic structure. Like lanthanum, actinium has oxidation of +3, but it is less reactive and has more pronounced basic properties. Among other trivalent actinides Ac3+ is least acidic, i.e. has the weakest tendency to hydrolyze in aqueous solutions. Thorium is rather active chemically. Owing to lack of electrons on 6d and 5f orbitals, the tetravalent thorium compounds are colorless. At pH < 3, the solutions of thorium salts are dominated by the cations [Th(H2O)8]4+. The Th4+ ion is relatively large, and depending on the coordination number can have a radius between 0.95 and 1.14 Å. As a result, thorium salts have a weak tendency to hydrolyse. The distinctive ability of thorium salts is their high solubility, not only in water, but also in polar organic solvents. Protactinium exhibits two valence states; the +5 is stable, and the +4 state easily oxidizes to protactinium(V). Thus tetravalent protactinium in solutions is obtained by the action of strong reducing agents in a hydrogen atmosphere. Tetravalent protactinium is chemically similar to uranium(IV) and thorium(IV). Fluorides, phosphates, hypophosphate, iodate and phenylarsonates of protactinium(IV) are insoluble in water and dilute acids. Protactinium forms soluble carbonates. The hydrolytic properties of pentavalent protactinium are close to those of tantalum(V) and niobium(V). The complex chemical behavior of protactinium is a consequence of the start of the filling of the 5f shell in this element. 2 are also the common form of Np and Pu in the +6 oxidation state. Uranium(IV) compounds exhibit reducing properties, e.g., they are easily oxidized by atmospheric oxygen. Uranium(III) is a very strong reducing agent. Owing to the presence of d-shell, uranium (as well as many other actinides) forms organometallic compounds, such as UIII(C5H5)3 and UIV(C5H5)4. Neptunium has valence states from 3 to 7, which can be simultaneously observed in solutions. The most stable state in solution is +5, but the valence +4 is preferred in solid neptunium compounds. Neptunium metal is very reactive. Ions of neptunium are prone to hydrolysis and formation of coordination compounds. Plutonium also exhibits valence states between 3 and 7 inclusive, and thus is chemically similar to neptunium and uranium. It is highly reactive, and quickly forms an oxide film in air. Plutonium reacts with hydrogen even at temperatures as low as 25–50 °C; it also easily forms halides and intermetallic compounds. Hydrolysis reactions of plutonium ions of different oxidation states are quite diverse. Plutonium(V) can enter polymerization reactions. The largest chemical diversity among actinides is observed in americium, which can have valence between 2 and 6. Divalent americium is obtained only in dry compounds and non-aqueous solutions (acetonitrile). Oxidation states +3, +5 and +6 are typical for aqueous solutions, but also in the solid state. Tetravalent americium forms stable solid compounds (dioxide, fluoride and hydroxide) as well as complexes in aqueous solutions. It was reported that in alkaline solution americium can be oxidized to the heptavalent state, but these data proved erroneous. The most stable valence of americium is 3 in the aqueous solutions and 3 or 4 in solid compounds. Valence 3 is dominant in all subsequent elements up to lawrencium (with the possible exception of nobelium). Curium can be tetravalent in solids (fluoride, dioxide). Berkelium, along with a valence of +3, also shows the valence of +4, more stable than that of curium; the valence 4 is observed in solid fluoride and dioxide. The stability of Bk4+ in aqueous solution is close to that of Ce4+. Only valence 3 was observed for californium, einsteinium and fermium. The divalent state is proven for mendelevium and nobelium, and in nobelium it is more stable than the trivalent state. Lawrencium shows valence 3 both in solutions and solids. The redox potential increases from −0.32 V in uranium, through 0.34 V (Np) and 1.04 V (Pu) to 1.34 V in americium revealing the increasing reduction ability of the An4+ion from americium to uranium. All actinides form AnH3 hydrides of black color with salt-like properties. Actinides also produce carbides with the general formula of AnC or AnC2(U2C3 for uranium) as well as sulfides An2S3 and AnS2. An2O3 + 3 H2O → 2 An(OH)3. These bases are poorly soluble in water and by their activity are close to the hydroxides of rare-earth metals. The strongest base is of actinium. All compounds of actinium are colorless, except for black actinium sulfide (Ac2S3). Dioxides of tetravalent actinides crystallize in the cubic system, same as in calcium fluoride. Thorium dioxide is a refractory material with the highest melting point among any known oxide (3390 °C). Adding 0.8–1% ThO2 to tungsten stabilizes its structure, so the doped filaments have better mechanical stability to vibrations. To dissolve ThO2 in acids, it is heated to 500–600 °C; heating above 600 °C produces a very resistant to acids and other reagents form of ThO2. Small addition of fluoride ions catalyses dissolution of thorium dioxide in acids. Two protactinium oxides were obtained: PaO2 (black) and Pa2O5(white); the former is isomorphic with ThO2 and the latter is easier to obtain. Both oxides are basic, and Pa(OH)5is a weak, poorly soluble base. Decomposition of certain salts of uranium, for example UO2(NO3)·6H2O in air at 400 °C, yields orange or yellow UO3. This oxide is amphoteric and forms several hydroxides, the most stable being UO2(OH)2. Reaction of uranium(VI) oxide with hydrogen results in uranium dioxide, which is similar in its properties with ThO2. This oxide is also basic and corresponds to the uranium hydroxide (U(OH)4). Plutonium, neptunium and americium form two basic oxides: An2O3 and AnO2. Neptunium trioxide is unstable; thus, only Np3O8 could be obtained so far. However, the oxides of plutonium and neptunium with the chemical formula AnO2 and An2O3 are well characterized. Actinides easily react with halogens forming salts with the formulas MX3 and MX4 (X = halogen). So the first berkelium compound, BkCl3, was synthesized in 1962 with an amount of 3 nanograms. Like the halogens of rare earth elements, actinide chlorides, bromides, andiodides are water-soluble, and fluorides are insoluble. Uranium easily yields a colorless hexafluoride, which sublimates at a temperature of 56.5 °C; because of its volatility, it is used in the separation of uranium isotopes with gas centrifuge or gaseous diffusion. Actinide hexafluorides have properties close to anhydrides. They are very sensitive to moisture and hydrolyze forming AnO2F2. The pentachloride and black hexachloride of uranium were synthesized, but they are both unstable. However, in these reactions the regenerating hydrogen can react with the metal, forming the corresponding hydride. Uranium reacts with acids and water much more easily than thorium. Actinide salts can also be obtained by dissolving the corresponding hydroxides in acids. Nitrates, chlorides, sulfates and perchlorates of actinides are water-soluble. When crystallizing from aqueous solutions, these salts forming a hydrates, such as Th(NO3)4·6H2O, Th(SO4)2·9H2O and Pu2(SO4)3·7H2O. Salts of high-valence actinides easily hydrolyze. So, colorless sulfate, chloride, perchlorate and nitrate of thorium transform into basic salts with formulas Th(OH)2SO4 and Th(OH)3NO3. The solubility and insolubility of trivalent and tetravalent actinides is like that of lanthanide salts. So phosphates, fluorides, oxalates, iodates and carbonates of actinides are weakly soluble in water; they precipitate as hydrates, such as ThF4·3H2O and Th(CrO4)2·3H2O. Actinides with oxidation state +6, except for the AnO22+-type cations, form [AnO4]2−, [An2O7]2− and other complex anions. For example, uranium, neptunium and plutonium form salts of the Na2UO4 (uranate) and (NH4)2U2O7 (diuranate) types. In comparison with lanthanides, actinides more easily form coordination compounds, and this ability increases with the actinide valence. Trivalent actinides do not form fluoride coordination compounds, whereas tetravalent thorium forms K2ThF6, KThF5, and even K5ThF9 complexes. Thorium also forms the corresponding sulfates (for example Na2SO4·Th (SO4)2·5H2O), nitrates and thiocyanates. Salts with the general formula An2Th(NO3)6·nH2O are of coordination nature, with the coordination number of thorium equal to 12. Even easier is to produce complex salts of pentavalent and hexavalent actinides. The most stable coordination compounds of actinides – tetravalent thorium and uranium – are obtained in reactions with diketones, e.g. acetylacetone. Interior of a smoke detectorcontaining americium-241. While actinides have some established daily-life applications, such as in smoke detectors (americium) and gas mantles(thorium), they are mostly used in nuclear weapons and use as a fuel in nuclear reactors. The last two areas exploit the property of actinides to release enormous energy in nuclear reactions, which under certain conditions may become self-sustaining chain reaction. Self-illumination of a nuclear reactor by Cherenkov radiation. Other promising actinide isotopes for nuclear power are thorium-232 and its product from the thorium fuel cycle, uranium-233. The core of most Generation II nuclear reactors contains a set of hollow metal rods, usually made of zirconium alloys, filled with solid nuclear fuel pellets – mostly oxide, carbide, nitride or monosulfide of uranium, plutonium or thorium, or their mixture (the so-called MOX fuel). The most common fuel is oxide of uranium-235. Fast neutrons are slowed by moderators, which contain water, carbon, deuterium, or beryllium, as thermal neutrons to increase the efficiency of their interaction with uranium-235. The rate of nuclear reaction is controlled by introducing additional rods made of boronor cadmium or a liquid absorbent, usually boric acid. Reactors for plutonium production are called breeder reactor or breeders; they have a different design and use fast neutrons. Emission of neutrons during the fission of uranium is important not only for maintaining the nuclear chain reaction, but also for the synthesis of the heavier actinides. Uranium-239 converts via β-decay into plutonium-239, which, like uranium-235, is capable of spontaneous fission. The world’s first nuclear reactors were built not for energy, but for producing plutonium-239 for nuclear weapons. About half of the produced thorium is used as the light-emitting material of gas mantles. Thorium is also added into multicomponent alloys of magnesium and zinc. So the Mg-Th alloys are light and strong, but also have high melting point and ductility and thus are widely used in the aviation industry and in the production of missiles. Thorium also has good electron emission properties, with long lifetime and low potential barrier for the emission. The relative content of thorium and uranium isotopes is widely used to estimate the age of various objects, including stars (see radiometric dating). The major application of plutonium has been in nuclear weapons, where the isotope plutonium-239 was a key component due to its ease of fission and availability. Plutonium-based designs allow reducing thecritical mass to about a third of that for uranium-235. The “Fat Man“-type plutonium bombs produced during the Manhattan Project used explosive compression of plutonium to obtain significantly higher densities than normal, combined with a central neutron source to begin the reaction and increase efficiency. Thus only 6.2 kg of plutonium was needed for an explosive yieldequivalent to 20 kilotons of TNT. (See also Nuclear weapon design.) Hypothetically, as little as 4 kg of plutonium—and maybe even less—could be used to make a single atomic bomb using very sophisticated assembly designs. Plutonium-238 is potentially more efficient isotope for nuclear reactors, since it has smaller critical mass than uranium-235, but it continues to release much thermal energy (0.56 W/g) by decay even when the fission chain reaction is stopped by control rods. Its application is limited by the high price (about 1000 USD/g). This isotope has been used in thermopiles and water distillation systems of some space satellites and stations. So Galileo and Apollo spacecraft (e.g. Apollo 14) had heaters powered by kilogram quantities of plutonium-238 oxide; this heat is also transformed into electricity with thermopiles. The decay of plutonium-238 produces relatively harmless alpha particles and is not accompanied by gamma-irradiation. Therefore, this isotope (~160 mg) is used as the energy source in heart pacemakers where it lasts about 5 times longer than conventional batteries. Actinium-227 is used as a neutron source. Its high specific energy (14.5 W/g) and the possibility of obtaining significant quantities of thermally stable compounds are attractive for use in long-lasting thermoelectric generators for remote use. 228Ac is used as an indicator of radioactivity in chemical research, as it emits high-energy electrons (2.18 MeV) that can be easily detected. 228Ac–228Ra mixtures are widely used as an intense gamma-source in industry and medicine. Development of self-glowing actinide-doped materials with durable crystalline matrices is a new area of actinide utilization as the addition of alpha-emitting radionuclides to some glasses and crystals may confer luminescence. Periodic table with elements colored according to the half-life of their most stable isotope. Elements which contain at least one stable isotope. Slightly radioactive elements: the most stable isotope is very long-lived, with a half-life of over four million years. Moderately radioactive elements: the most stable isotope has half-life between 800 and 34,000 years. Very radioactive elements: the most stable isotope has half-life between one day and 103 years. Highly radioactive elements: the most stable isotope has half-life between several minutes and one day. Extremely radioactive elements: the most stable isotope has half-life less than several minutes. Very little is known about these elements due to their extreme instability and radioactivity. Radioactive substances can harm human health via (i) local skin contamination, (ii) internal exposure due to ingestion of radioactive isotopes, and (iii) external overexposure by β-activity and γ-radiation. Together with radium and transuranium elements, actinium is one of the most dangerous radioactive poisons with high specific α-activity. The most important feature of actinium is its ability to accumulate and remain in the surface layer of skeletons. At the initial stage of poisoning, actinium accumulates in the liver. Another danger of actinium is that it undergoes radioactive decay faster than being excreted. Adsorption from the digestive tract is much smaller (~0.05%) for actinium than radium. Protactinium in the body tends to accumulate in the kidneys and bones. The maximum safe dose of protactinium in the human body is 0.03 µCi that corresponds to 0.5 micrograms of 231Pa. This isotope, which might be present in the air as aerosol, is 2.5×108 times more toxic than hydrocyanic acid. Plutonium, when entering the body through air, food or blood (e.g. a wound), mostly settles in the lungs, liver and bones with only about 10% going to other organs, and remains there for decades. The long residence time of plutonium in the body is partly explained by its poor solubility in water. Some isotopes of plutonium emit ionizing α-radiation, which damages the surrounding cells. Themedian lethal dose (LD50) for 30 days in dogs after intravenous injection of plutonium is 0.32 milligram per kg of body mass, and thus the lethal dose for humans is approximately 22 mg for a person weighing 70 kg; the amount for respiratory exposure should be approximately four times greater. Another estimate assumes that plutonium is 50 times less toxic than radium, and thus permissible content of plutonium in the body should be 5 µg or 0.3 µCi. Such amount is nearly invisible in under microscope. After trials on animals, this maximum permissible dose was reduced to 0.65 µg or 0.04 µCi. Studies on animals also revealed that the most dangerous plutonium exposure route is through inhalation, after which 5–25% of inhaled substances is retained in the body. Depending on the particle size and solubility of the plutonium compounds, plutonium is localized either in the lungs or in the lymphatic system, or is absorbed in the blood and then transported to the liver and bones. Contamination via food is the least likely way. In this case, only about 0.05% of soluble 0.01% insoluble compounds of plutonium absorbs into blood, and the rest is excreted. Exposure of damaged skin to plutonium would retain nearly 100% of it. Using actinides in nuclear fuel, sealed radioactive sources or advanced materials such as self-glowing crystals has many potential benefits. However, a serious concern is the extremely high radiotoxicity of actinides and their migration in the environment. Use of chemically unstable forms of actinides in MOX and sealed radioactive sources is not appropriate by modern safety standards. There is a challenge to develop stable and durable actinide-bearing materials, which provide safe storage, use and final disposal. A key need is application of actinide solid solutions in durable crystalline host phases. In chemistry, post-transition metals are the metallic elements in the periodic table located between the transition metals (to their left) and the metalloids (to their right). Usually included in this category are gallium, indium and thallium;tin and lead; and bismuth. Which elements are counted as post-transition metals depends, in periodic table terms, on where the transition metals are taken to end and where the metalloids or non-metals are taken to start. Physically, post-transition metals are soft (or brittle), have poor mechanical strength, and melting points lower than those of the transition metals; most also have boiling points lower than those of the transition metals. Being close to the metal-nonmetal border, their crystalline structures tend to showcovalent or directional bonding effects, having generally greater complexity or fewer nearest neighbours than other metallic elements. Chemically, they are characterised—to varying degrees—by covalent bonding tendencies, acid-base amphoterism and the formation of anionic species such as aluminates, stannates, and bismuthates (in the case of aluminium, tin, and bismuth, respectively). They can also form Zintl phases (half-metallic compounds formed between highly electropositive metals and moderatelyelectronegative metals or metalloids). The expression ‘post-transition metals’ is used here as there is no IUPAC-approved collective name for these metals. Occasionally, some or all of them have instead been referred to as B-subgroup metals, other metals, or p-block metals; and by at least eleven other alternative labels. All these labels are surveyed later in this article. Scatter plot of electronegativity values and melting points for metals (up to fermium, element 100) and some borderline elements (Ge, As, Sb, At). Elements categorised by some authors as post-transition metals are distinguished by their relatively high electronegativity values and relatively low melting points. High electronegativity corresponds to increasing nonmetallic character; low melting temperature corresponds to weaker cohesive forces between atoms and reduced mechanical strength. The geography of the plot broadly matches that of the periodic table. Starting from the bottom left, and proceeding clockwise, the alkali metals are followed by the heavier alkaline earth metals; the rare earths and actinides (Sc, Y and the lanthanides being here treated as rare earths); transition metals with intermediate electronegativity values and melting points; therefractory metals; the platinum group metals; and the coinage metals leading and forming a part of the post-transition metals. Usually included in this category are the group 13–15 metals: gallium, indium and thallium; tin and lead; and bismuth. Other elements sometimes included are copper, silver and gold (which are usually considered to be transition metals); zinc, cadmium and mercury (which are otherwise considered to be transition metals); and aluminium, germanium, arsenic and antimony (the latter three of which are usually considered to be metalloids). Astatine, which is usually classified as a nonmetal or a metalloid, has been predicted to have a metallic crystalline structure. If so, it would be a post-transition metal. Elements 113–117 may be post-transition metals; insufficient quantities of them have been synthesized to allow investigation of their actual physical and chemical properties. Which elements start to be counted as post-transition metals depends, in periodic table terms, on where the transition metals are taken to end. [n 3] In the 1950s, most inorganic chemistry textbooks defined transition elements as finishing at group 10 (nickel, palladium andplatinum), therefore excluding group 11 (copper, silver and gold), and group 12 (zinc,cadmium and mercury). A survey of chemistry books in 2003 showed that the transition metals ended at either group 11 or group 12 with roughly equal frequency. Where the post-transition metals end depends on where the metalloids or nonmetals start. Boron, silicon, germanium, arsenic, antimony and tellurium are commonly recognised as metalloids; other authors treat some or all of these elements as nonmetals. The group 11 metals are typically categorised as transition metals given they can form ions with incomplete d-shells. Physically, they have the relatively low melting points and high electronegativity values associated with post-transition metals. “The filled d subshell and free s electron of Cu, Ag, and Au contribute to their high electrical and thermal conductivity. Transition metals to the left of group 11 experience interactions between s electrons and the partially filled d subshell that lower electron mobility.” Chemically, the group 11 metals in their +1 valence states show similarities to other post-transition metals; they are occasionally classified as such. Silver is a soft metal (MH 2.5–3) with low mechanical strength. It has a close-packed face-centred cubic structure (BCN 12). The chemistry of silver is dominated by its +1 valence state in which it shows generally similar physical and chemical properties to compounds of thallium, a main group metal, in the same oxidation state. It tends to bond covalently in most of its compounds. The oxide (Ag2O) is amphoteric, with basic properties predominating. Silver forms a series of oxoargentates (M3AgO2, M = Na, K, Rb). It is a constituent of Zintl phases such as Li2AgM (M = Al, Ga, In, Tl, Si, Ge, Sn or Pb)and Yb3Ag2. Gold is a soft metal (MH 2.5–3) that is easily deformed. It has a close-packed face-centred cubic structure (BCN 12). The chemistry of gold is dominated by its +3 valence state; all such compounds of gold feature covalent bonding, as do its stable +1 compounds. Gold oxide (Au2O3) is amphoteric, with acid properties predominating; it forms anionic hydroxoaurates M[Au(OH)4] where M = Na, K, 1⁄2Ba, Tl; and aurates such as NaAuO2. Gold is a constituent of Zintl phases such as M2AuBi (M = Li or Na);Li2AuM (M = In, Tl, Ge, Pb, Sn) and Ca5Au4. On the group 12 transition metals (zinc, cadmium and mercury), Smith observed that, “Textbook writers have always found difficulty in dealing with these elements.” There is an abrupt and significant reduction in physical metallic character from group 11 to group 12. Their chemistry is that of main group elements. A 2003 survey of chemistry books showed that they were treated as either transition metals or main group elements on about a 50/50 basis. [n 6] The IUPAC Red Book notes that although the group 3−12 elements are commonly referred to as the transition elements, the group 12 elements are not always included. The group 12 elements do not satisfy the IUPAC Gold Bookdefinition of a transition metal[n 7] (other than in the case of mercury at 4 K). Zinc is a soft metal (MH 2.5) with poor mechanical properties. It has a crystalline structure (BCN 6+6) that is slightly distorted from the ideal. Many zinc compounds are markedly covalent in character. The oxides of zinc in its preferred oxidation state of +2, namely ZnO and Zn(OH)2, are amphoteric; it forms anionic zincates in strongly basic solutions. Zinc forms Zintl phases such as LiZn, NaZn13 and BaZn13. Highly purified zinc, at room temperature, is ductile. It reacts with moist air to form a thin layer of carbonate that prevents further corrosion. Cadmium is a soft, ductile metal (MH 2.0) that undergoes substantial deformation, under load, at room temperature. Like zinc, it has a crystalline structure (BCN 6+6) that is slightly distorted from the ideal. The halides of cadmium, with the exception of the fluoride, exhibit a substantially covalent nature. The oxides of cadmium in its preferred oxidation state of +2, namely CdO and Cd(OH)2, are weakly amphoteric; it forms cadmates in strongly basic solutions. Cadmium forms Zintl phases such as LiCd, RbCd13 and CsCd13. When heated in air to a few hundred degrees, cadmium represents a toxicity hazard due to the release of cadmium vapour; when heated to its boiling point in air (just above 1000 K; 725 C; 1340 F; cf steel ~2700 K; 2425 C; 4400 F), the cadmium vapour oxidizes, ‘with a reddish-yellow flame, dispersing as an aerosol of potentially lethal CdO particles.’ Cadmium is otherwise stable in air and in water, at ambient conditions, protected by a layer of cadmium oxide. Mercury is a liquid at room temperature. It has the weakest metallic bonding of all, as indicated by its bonding energy (61 kJ/mol) and melting point (−39 °C) which, together, are the lowest of all the metallic elements. [n 8] Solid mercury (MH 1.5) has a distorted crystalline structure, with mixed metallic-covalent bonding, and a BCN of 6. “All of the [Group 12] metals, but especially mercury, tend to form covalent rather than ionic compounds.” The oxide of mercury in its preferred oxidation state (HgO; +2) is weakly amphoteric, as is the congener sulfide HgS. It forms anionic thiomercurates (such as Na2HgS2 and BaHgS3) in strongly basic solutions. [n 9] It forms or is a part of Zintl phases such as NaHg and K8In10Hg. Mercury is a relatively inert metal, showing little oxide formation at room temperature. Indium is a soft, highly ductile metal (MH 1.0) with a low tensile strength. It has a partially distorted crystalline structure (BCN 4+8) associated with incompletely ionised atoms. The tendency of indium ‘…to form covalent compounds is one of the more important properties influencing its electrochemical behavior’. The oxides of indium in its preferred oxidation state of +3, namely In2O3 and In(OH)3 are weakly amphoteric; it forms anionic indates in strongly basic solutions. Indium forms Zintl phases such as LiIn, Na2In and Rb2In3. Indium does not oxidize in air at ambient conditions. Tin is a soft, exceptionally weak metal (MH 1.5);[n 16] a 1-cm thick rod will bend easily under mild finger pressure. It has an irregularly coordinated crystalline structure (BCN 4+2) associated with incompletely ionised atoms. All of the Group 14 elements form compounds in which they are in the +4, predominantly covalent, oxidation state; even in the +2 oxidation state tin generally forms covalent bonds. The oxides of tin in its preferred oxidation state of +2, namely SnO and Sn(OH)2, are amphoteric; it forms stannites in strongly basic solutions.Below 13 °C (55.4 °F) tin changes its structure and becomes ‘grey tin’, which has the same structure as diamond, silicon and germanium (BCN 4). This transformation causes ordinary tin to crumble and disintegrate since, as well as being brittle, grey tin occupies more volume due to having a less efficient crystalline packing structure. Tin forms Zintl phases such as Na4Sn, BaSn, K8Sn25 and Ca31Sn20. It has good corrosion resistance in air on account of forming a thin protective oxide layer. Pure tin has no structural uses. It is used in lead-free solders, and as a hardening agent in alloys of other metals, such as copper, lead, titanium and zinc. Lead is a soft metal (MH 1.5) which, in many cases, is unable to support its own weight. It has a close-packed structure (BCN 12) but an abnormally large inter-atomic distance that has been attributed to partial ionisation of the lead atoms. It forms a semi-covalent dioxide PbO2; a covalently bonded sulfide PbS; covalently bonded halides; and a range of covalently bonded organolead compounds such as the lead(II) mercaptan Pb(SC2H5)2, lead tetra-acetate Pb(CH3CO2)4, and the once common, anti-knock additive, tetra-ethyl lead (CH3CH2)4Pb. The oxide of lead in its preferred oxidation state (PbO; +2) is amphoteric; it forms anionic plumbates in strongly basic solutions. Lead forms Zintl phases such as CsPb, Sr31Pb20, La5Pb3N and Yb3Pb20. It has reasonable to good corrosion resistance; in moist air it forms a mixed gray coating of oxide, carbonate and sulfate that hinders further oxidation. Arsenic is a moderately hard (MH 3.5) and brittle semi-metallic element. It is commonly regarded as a metalloid, or by some other authors as either a metal or a non-metal. It exhibits poor electrical conductivity which, like a metal, decreases with temperature. It has a relatively open and partially covalent crystalline structure (BCN 3+3). Arsenic forms covalent bonds with most other elements. The oxide in its preferred oxidation state (As2O3, +3) is amphoteric,[n 17] as is the corresponding oxoacid in aqueous solution (H3AsO3) and congener sulphide (As2S3). Arsenic forms a series of anionic arsenates such as Na3AsO3and PbHAsO4, and Zintl phases such as Na3As, Ca2As and SrAs3. 4 are known, oxyanion formation being a tendency of nonmetals. The hydroxide of astatine At(OH) is presumed to be amphoteric. [n 21]Astatine forms covalent compounds with nonmetals, including hydrogen astatide HAt and carbon tetraastaide CAt4. [n 22] At− anions have been reported to form astatides with silver, thallium, palladium and lead. Pruszyński et al. note that astatide ions should form strong complexes with soft metal cations such as Hg2+, Pd2+, Ag+ and Tl3+; they list the astatide formed with mercury as Hg(OH)At. Abrikosov distinguishes between ordinary metals, and transition metals where the inner shells are not filled. The ordinary metals have lower melting points and cohesive energies than those of the transition metals. Gray identifies as ordinary metals: aluminium, gallium, indium, thallium, element 113, tin, lead, [flerovium], bismuth, element 115, and [livermorium]. He adds that, ‘in reality most of the metals that people think of as ordinary are in fact transition metals…’. As noted, the metals falling between the transition metals and the metalloids on the periodic table are sometimes called other metals (see also, for example, Taylor et al. ).‘Other’ in this sense has the related meanings of, ‘existing besides, or distinct from, that already mentioned’ (that is, the alkali and alkaline earth metals, the lanthanides and actinides, and the transition metals); ‘auxiliary’; ‘ancillary, secondary’. According to Gray there should be a better name for these elements than ‘other metals’. The p-block metals are the metals in groups 13‒15 (or 16) of the periodic table. Usually, this includes aluminium, gallium, indium and thallium; tin and lead; and bismuth. Germanium, antimony and polonium are sometimes also included, although the first two are commonly recognised as metalloids. The p-block metals tend to have structures that display low coordination numbers and directional bonding. Pronounced covalency is found in their compounds; the majority of their oxides are amphoteric. Slater divides the metals ‘fairly definitely, though not perfectly sharply’ into the ordinary metals and the peculiar metals, the latter of which verge on the nonmetals. The peculiar metals occur towards the ends of the rows of the periodic table and include ‘approximately:’ gallium, indium, and thallium; carbon, silicon ‘(both of which have some metallic properties, though we have previously treated them as nonmetals),’ germanium and tin; arsenic, antimony, and bismuth; and selenium ‘(which is partly metallic)’ and tellurium. The ordinary metals have centro-symmetrical crystalline structures[n 27] whereas the peculiar metals have structures involving directional bonding. More recently, Joshua observed that the peculiar metals have mixed metallic-covalent bonding. In modern use, the term ‘semimetal’ sometimes refers, loosely or explicitly, to metals with incomplete metallic character in crystalline structure, electrical conductivity or electronic structure. Examples include gallium, ytterbium, bismuth, mercury and neptunium. Metalloids, which are in-between elements that are neither metals nor nonmetals, are also sometimes instead called semimetals. The elements commonly recognised as metalloids are boron, silicon, germanium, arsenic, antimony and tellurium. In old chemistry, before the publication in 1789 of Lavoisier’s ‘revolutionary’ Elementary Treatise on Chemistry, a semimetal was a metallic element with ‘very imperfect ductility and malleability’ such as zinc, mercury or bismuth.